Fitness Reality X Class Power Tower – Is It Worth Your Money? In the past I’ve reviewed several equipment pieces manufactured by Fitness Reality, including two power racks and one of their weight benches. Now I’ve finally took the time to make a comprehensive review of Fitness Reality X Class Power Tower. Some of you already know that the “X Class” variation is more advanced and equipment under this category is made of higher-quality materials, although this is also reflected on the price. This particular fella is a high-capacity multi-function power tower with unique design and various accessories, that most of the power towers do not posses. So let’s take a closer look. The entire frame of the power tower is made of heavy-duty powder coated steel tube that supports up to 400 lbs. The ergonomically designed backrest and armrests are thick and cushioned for maximum comfort. The dip station comes with higher-than-standard bars with 3 different adjustable positions. The pull-up / chin-up station comes with 6 usable grips for various exercises. Last but not least are the two adjustable handlebars with foam rollers at the base of the tower with 7 mounting positions. The Fitness Reality X Class Power Tower’s assembled dimensions are 63.4″ L x 49″ W x 83″ H (161 x 124.5 x 210.8 cm) and the weight is 150 lbs (68 kg). Fitness Reality also offers 3 years warranty for parts and 10 years warranty for the frame. Let’s start with the assembly. Thanks to the clear instructions and provided tools, the assembly is pretty straightforward. Most of the users took it about an hour and should be doable by one person, although having a buddy to help you out never hurts, right? Also, please keep in mind that this is heavy-duty power tower that weights a lot, so make sure you’ve selected the right spot for it, before starting the assembly. 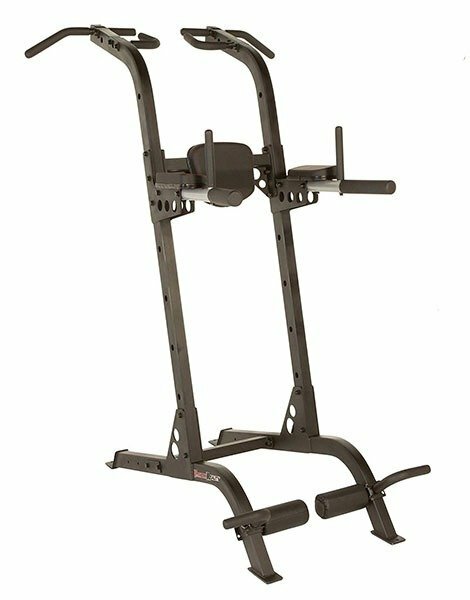 Fitness Reality X Class power tower has many adjustable parts, including dip station, backrest and sit-up bars. If you are 6’1” + then I‘d suggest to assemble the backrest on the topmost bolt. But you can of course move it later on, if it does not fit you. The backrest itself is ergonomically designed and well-padded. The frame is indeed, heavy-duty steel. It does not wobble at all and weights a lot. Personally, I think it is worth paying the extra buck for this kind of quality. Also please note that the base of the power tower is angled and quite frankly, takes a bit of extra space. All this however, is for the extra stability. You also have the option to bolt it to the floor, but with this kind of heavy-weight, it should not be necessary. The dip station is also high quality; the bars are thick enough to be comfortable for most hands. The measured mid-point of the dip bars is 23.5 inches. The handles also use above-quality dense foam, not the type you can expect from cheaper power towers. The cushioned armrests are really thick; 2.25-in really makes a difference. The multi-grip pull up station is also very well designed. You can do narrow, wide and reverse pull ups and chin ups with it. But since it does not have a bar, but only grips, you can’t really do very-close narrow pull-ups, but this is not much of an issue. Great additions are the bars and the foam rollers at the base of the power tower. You can use them for push-ups and for sit-ups, which adds several more exercises to your power tower workout. They also have 7 different positions, so you can set it according to your needs. I’m very happy to tell my readers that Fitness Reality didn’t go cheap on any parts of the tower. The frame, dip station, foam and cushions – all is above standard quality. This is also, naturally, reflected on the price as well. Eventually, it is up to you if you are willing to pay the extra buck for this sort of quality, but in my humble opinion, I think that Fitness Reality X Class Power Tower is worth the money.